Is your golf cart’s solenoid giving you trouble? Knowing the symptoms of a bad solenoid on golf cart can help you avoid troubleshooting and target the issue. You’ve studied up on the latest golf cart models, make sure that you operate your cart safely, and follow basic maintenance rules. However, lately, your golf cart has been having trouble starting. You suspect that you may have a bad solenoid on your hands. But what are the most common solenoid problems? And what are the biggest symptoms of a bad solenoid on golf cart? Keep on reading this post when you’re ready to find out. We’ll also let you know where you can go to find the quality replacement parts you need for your cart. Before we get into the signs of a bad solenoid on a golf cart, let’s make sure you know what one is. A solenoid is integral to your golf cart’s functionality, as it’s the main switch that directs the battery’s current to your generator, traction motor, or starter. However, because it has so much responsibility, it can break down somewhat often. If you have a battery-powered golf cart, it may break down even more frequently. Remember that your golf cart’s solenoid is in use whenever your foot is down on the pedal–and it stops and starts right along with your golf cart. This can lead to solenoid problems, especially if you take your cart out often. Since a single round of golf can take anywhere from two to four hours on average, the solenoid works overtime all the time. Now, let’s check out the most common signs of problems with the solenoid in your golf cart. Remember that you don’t need to experience all of these issues for there to be a problem–though you may deal with more than one of them at work. If you ignore any of these problems, remember that things will only get worse. In addition to having to get a new solenoid, you may also have to get a completely new starter. If you’re driving a gas golf cart, your main issue will likely be your large contacts’ failure to release. If this happens, your starter is working even though the ignition is turned off. You may also have trouble with your spring being too worn down to properly pull the pinion back to the neutral position. This means that your starter isn’t able to disengage and that it’s working all the time. In some cases, you might even start to hear lots of small, continuous clicks when you try to turn on your cart. However, in spite of these clicks, your cart isn’t going anywhere. This means that your starter isn’t working at all. If you’re driving an electric golf cart, you may deal with fewer symptoms of a bad solenoid on golf cart. However, that doesn’t mean that you won’t ever run into any problems. The main sign of an issue in an electric cart is a lack of any “click” noise at all when you turn on your cart’s ignition. Usually, you’ll be able to hear the solenoid clicking both on and off whenever you switch your ignition. But if you don’t hear anything? It’s likely that the solenoid can no longer send electricity out to power the golf cart. In some cases, this happens because the coil of the battery is worn out or is too old. It can also be a sign of a faulty battery or even loose connections within the solenoid. Additionally, you could be dealing with overheated contacts. This is an issue you need to take seriously. Not only is it dangerous, but it can also wreak havoc on your starter as a whole. Of course, part of golf cart troubleshooting is also knowing how to test your solenoid for issues. First, grab a voltmeter and a wrench (a 1/2 inch wrench is your best bet.) Then, make sure you’ve unplugged any cables from your two big terminals, wrapping up the ends with tape to be on the safe side. 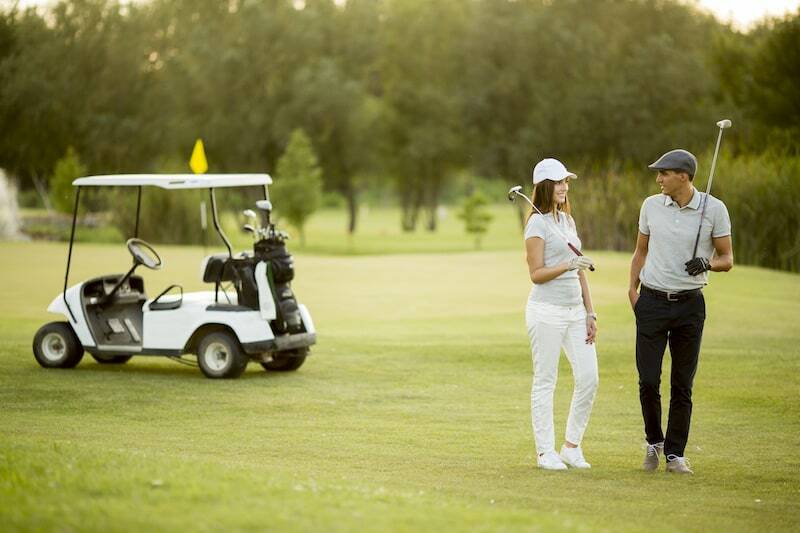 Ensure that your golf cart is completely off and that the cart is in neutral. Set your voltmeter to the ohms reading, and connect its probe to each one of the big terminals. Of course, the reading should be zero. Next, move the cart’s switch to forward, turn it on, and accelerate slowly. Your solenoid should click. Use the voltmeter to take another reading. If it’s between 0 to 0.4 ohms, your solenoid is still in good shape. If it’s above that, it’s time for a replacement. Finally, remember to buy a solenoid that’s compatible with the voltage in your golf cart. Usually, that means you’ll need a 36-volt option or a 48-volt option. Check your old solenoid if you’re unsure–the voltage is on the side. Need More Golf Cart Troubleshooting Tips? We hope that this post has helped you to better recognize the symptoms of a bad solenoid on golf cart. Remember to replace your solenoid as soon as possible to prevent this issue from getting any worse. 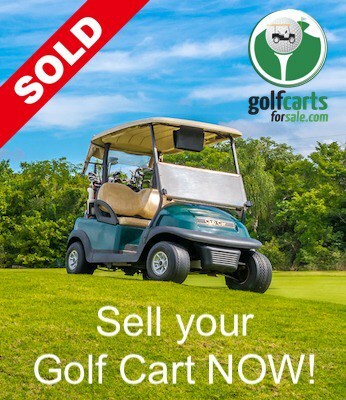 Looking for more advice about how to buy and maintain the perfect golf cart for your needs? We can help you with that. From the latest golf cart reviews, news about new models, and more, we provide all the tips you need. We also sell a wide variety of golf carts and accessories.